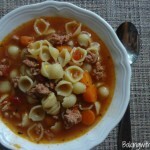 So Easy Hamburger Soup is a delicious meal made in the crock pot. Warm and flavorful, this recipe will be a fast favorite at your house. This So Easy Hamburger Soup was thrown together last minute while I was cold, in a hurry and to be completely honest, the tail end of the shopping cycle. 🙂 My pantry was looking a little bare and my hungry crew would want something to eat. You wanna know what was even better? Everyone LOVED it! It tasted great and it was extremely frugal. F.R.U.G.A.L. I think it cost our family less than $4 dollars to make and it fed our family of six not only supper, but a few of us had it for leftovers the next day. Do you have a slow cooker at home? I was talking with someone through social media who did not have a slow cooker. Do me a favor, will ya? If you don’t have a slow cooker you should get one. I use my slow cooker a few times a week. Without question. (Ask my family.) 🙂 Here are a few ideas for a slow cooker. There are programmable ones and simple ones. I personally go for the middle of the road slow cookers. The only trick to this soup is to not add the shells until about 45 minutes before you are going to eat. You don’t want the shells to get too soggy. Nobody wants soggy shells. Nobody. Think you will like this soup? You can try it with dumplings too. Delicious! This hamburger soup is a delicious and easy soup recipe that cooks in the slow cooker while you are away. Hamburger, noodles and carrots in a beef broth. Placed browned hamburger, tomatoes, beef broth, water, carrots, corn, *onion, tomato sauce in crock pot on low for 6 hours. minutes before serving, add shells. Stir at least once. *My family doesn't like to eat onion, but they like the taste. I place large onion pieces in the soup, then take the onion out before serving. 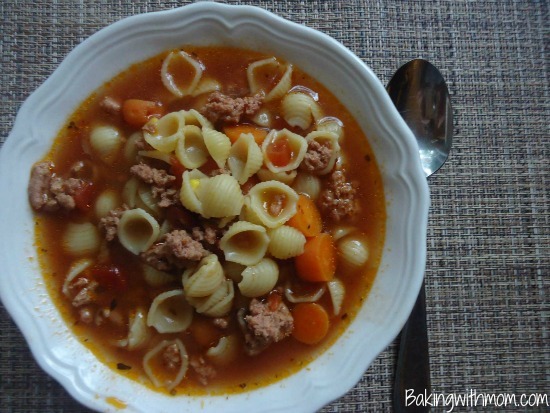 Have you tried this So Easy Hamburger Soup Recipe? What do you think? Is it a family favorite at your house? Want other recipes from BakingWithMom? Be sure to follow me on Pinterest and also sign up here to get a FREE biweekly newsletter delivered right to your mailbox. My picky 12 year old loves this! Is there a way to prepare the night before and then cook in a crockpot the next morning? Hello! I’m so glad to hear your son liked the soup! It is a favorite around here as well. I have fried up the hamburger, chopped up the carrots the night before and put it in the fridge. Then the morning of, I just throw it all into the crock pot since the rest of the ingredients are from cans. Make sure you don’t add the noodles until about 30 minutes before you eat or they will be too soggy. I hope this helps! This sounds delicious and I need to use up some ground beef in my fridge. If I wanted to cook this on the stove instead of the crockpot (because I don’t have 6 hours) how long would I need to cook it? I just made it on my stove top a few nights ago. I probably cooked it for 45 minutes. I don’t think it needs that long to cook, however, my husband doesn’t like crunchy carrots. If crunchy carrots doesn’t bother you, 30 minutes would be fine. I would add the pasta about 7-10 minutes before serving. This is exactly like the soup my granny fixed for us growing up. Then it became a soup for celebration, for a bad day and for what ailed us. I opened up this link and almost cried when i saw the photo. Thank you for bringing me that sweet memory. How many minutes do you cook the pasta? No where does it say to cook the pasta before adding. You don’t need to cook the pasta before adding it to the slow cooker. Add it to the slow cooker about 30 minutes before serving. I hope you enjoy it! The soup is a family favorite here! This is great advice! The soup is delicious, isn’t it? Hi, Sarah! I love a good recipe that tastes great and doesn’t cost $$ to put together! Thanks so much for sharing with us at On Display Thursday. Hope your week is off to a great start! Thanks! Hope your week is great as well! Nice soup 🙂 I had no idea you could add noodles in the crock pot!! WOW! thanks for the recipe and the tip! If you get a chance stop by our Snickerdoodle Sunday sometime! Yum! this looks so good. My coworker actually brought me lunch today and it looks similar. I’m stopping by from the Google+ group, nice to meet ya!